Mother’s Day is the perfect occasion to show the mothers in your life how much you love and cherish them. Akoya pearls represent a brilliant gift. Did you consider them? And it’s not too early to start planning your surprise. Whether you want to shower your own mother with gifts and attention, or you’re looking to buy something for your wife, aunt, teacher, or even gym instructor, we’ve got you covered. The Pearls Only team has put together some Mother’s Day gift ideas, so you can save time and make the mothers in your life happy. This year, Mother’s Day falls on May 13th, so you still have plenty of time to select the perfect gift. Plus, Mothering Day in the United Kingdom will be celebrated on March 11th. Keep reading to find out which are out top Akoya pearls gift suggestions. Since we love Akoya Pearls so much and we consider them a must-have in every pearl lover’s collection, we believe you will love these breathtaking pearl gift ideas that we’ve picked for you. The straw bag has been making a comeback! It’s the perfect accessory for summer: light, chic, and quite spacious. Go for a large tote bag or a basket tote for a more casual look. Choose a slouchy tote bag for someone who’s all about comfort! This double strand Japanese Akoya pearl bracelet is simply stunning! It’s made with high-quality Akoya pearls that have been certified for quality by the famous Japanese Pearl Export Association. The double knotted fine silk thread ensures that this bracelet is going to stay gorgeous for a long time! These days, more and more people are choosing to live their lives dairy-free. The benefits of nut milk are many and a great way to introduce these types of milk into your life is through a nut milk maker. Will she love to fresh almond milk every single day with just a push of a button? Then a nut milk maker needs to find its way to her! Just look at this stunning, Randy Black 7-8mm AA Quality Japanese Akoya 925 Sterling Silver Pearl Pendant. Set under the favored and desirable cubic zirconia’s sparkling and true AAA Luster, its beauty shines through the pendant. It is truly delicate, classy, and beyond beautiful. This is a great gift for any mother out there, especially those who love black pearls. But then again, who doesn’t?! 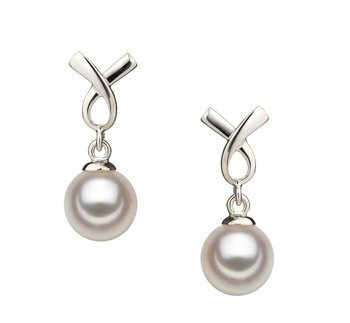 A stunning Akoya pearl set, such as the one above, is another wonderful Mother’s Day gift. We can assure you that she’ll love it! What is there not to like? This White Japanese Akoya Pearl and 14K Yellow Gold Set displays the quality every woman wants in her necklace and earrings set. Each piece holds the highest standards in quality the AAA shape and AAA luster remains consistent with the 6-7mm white Japanese pearls. Modern, trendy, yet classy, this set is for a true pearl lover! Some of the best gifts out there aren’t things at all. They’re experiences to be remembered and cherished. So, give her a gift that she will remember forever. A culinary vacation in Italy will include wine tastings, cooking lessons, and visits to various amazing restaurants. If not Italy, then maybe Greece, Hawaii, or Thailand! Who wouldn’t love to sample some of the world’s best wines, dishes, visit fascinating destinations, and learn to cook delicious foods? When it comes to pearl earrings, as with any other piece of jewelry, it all depends on your budget. The perfect sized pearls, they are not overwhelming or boastful, they are simply graceful in size and design. The AAA shape and mirror-like luster maintain their beautiful appearance when set against the .925 sterling silver. The dangling white pearls sit directly under the upside down ribbons and look fun and refreshing. Moreover, the posts for the earrings are sterling silver and come with sterling silver butterfly backs. They would look stunning on anyone. Whatever option you choose, she’ll love it if it shows that you put some heart in it!